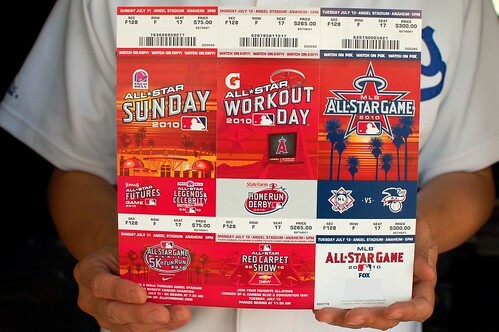 Mr. Monkey has tickets to all of the 2010 All-Star festivities. I accompanied him on Sunday. 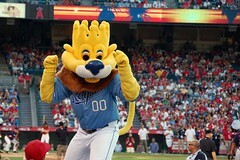 He went to the Home Run Derby Monday night and will be going to the All-Star Game Tuesday night with his buddy Mr. Denver. 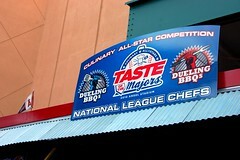 Of course, I was excited about the Culinary All-Star Competition. My fave guy was Chef Richard Montini because, when we asked him to be a pirate, he actually shouted, "ARRRRR!" Can you see his enthusiasm above? 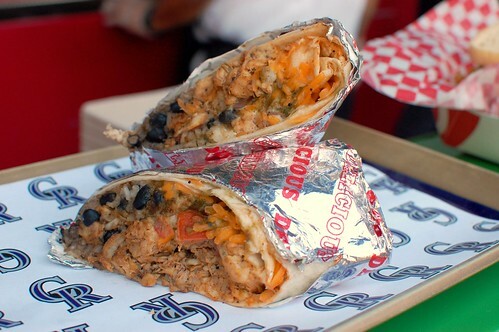 Colorado Rockies: Chicken burrito, pico de gallo, sour cream, guacamole. 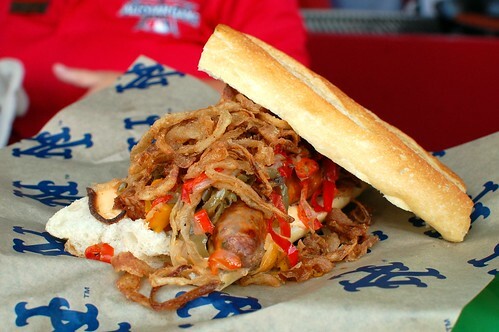 New York Mets: Twisted sausage and pepper sandwich, spicy chipotle mayonnaise. 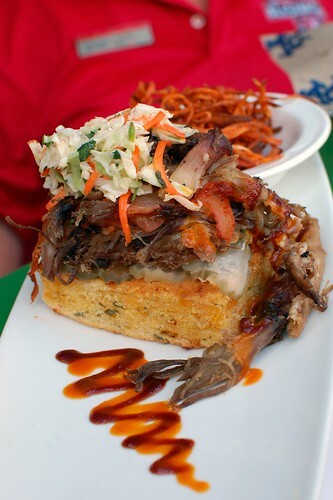 Atlanta Braves: Smoked BBQ pulled pork, jalapeño corn muffin, caramelized onions, cabbage slaw. 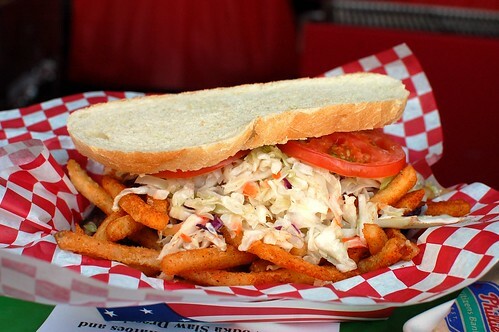 Pittsburgh Pirates: Pastrami sandwich, tomatoes, vodka slaw dressing. 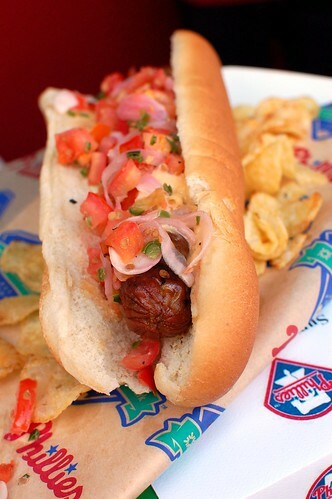 Philadelphia Phillies: Summer hot dog, pickled red onions, salsa, chipotles mayonnaise, cucumbers. 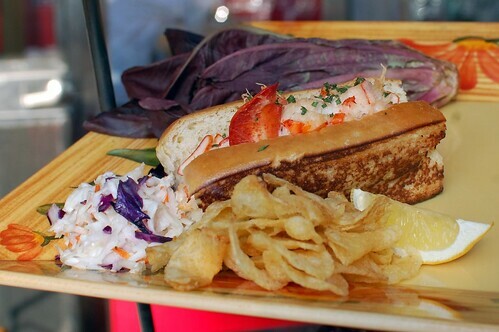 Boston Red Sox: Lobster roll on grilled bun. 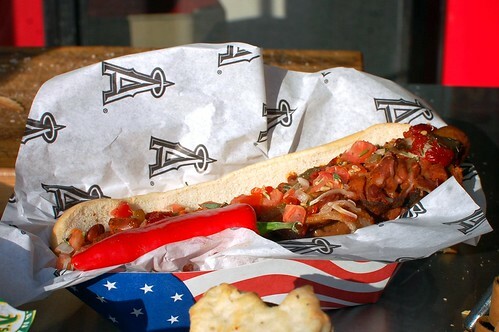 Anaheim Angels: Halo Dog with bacon, jack cheese, charro beans, Anaheim peppers. 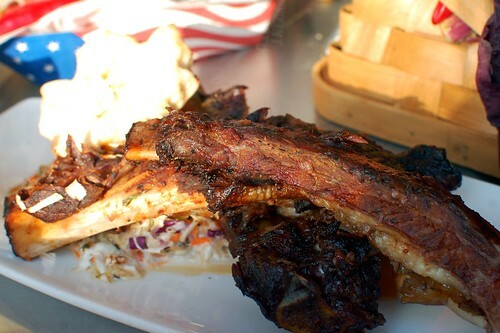 Toronto Blue Jays: Canadian whiskey-smoked BBQ ribs. 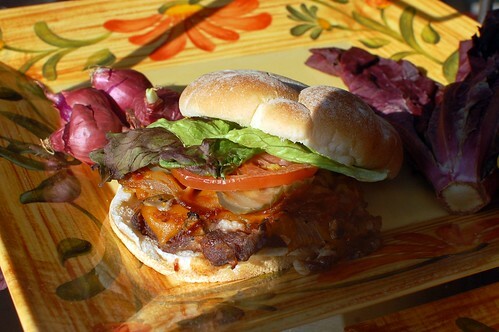 Kansas City Royals: Kansas City Stack -- seasoned rib-eye, cheese, bacon, sauteed mushrooms, onion rings, BBQ sauce, lettuce, tomato, pickle. 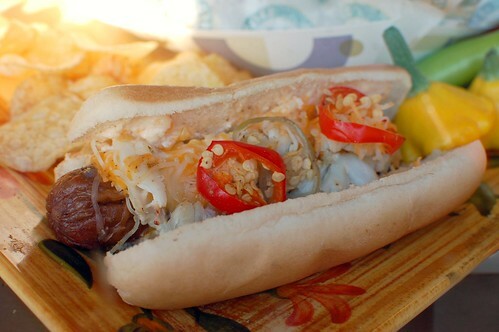 Baltimore Orioles: Crab Dog -- hot dog topped with creamed crab, shredded cheese, cherry pepper slices. Oakland Athletics: Jalapeño jack sausage atop mac 'n' cheese with green ketchup. Oh, yeah, there was sort of a game, too. 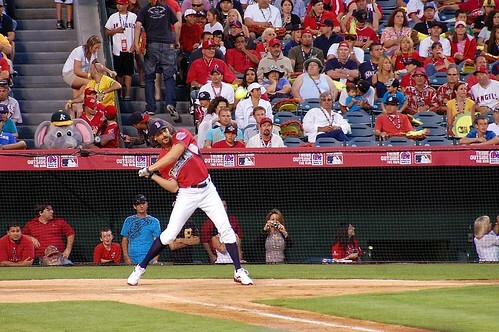 She not only pitched, but she hit a home run -- the first ever by a woman at this event! 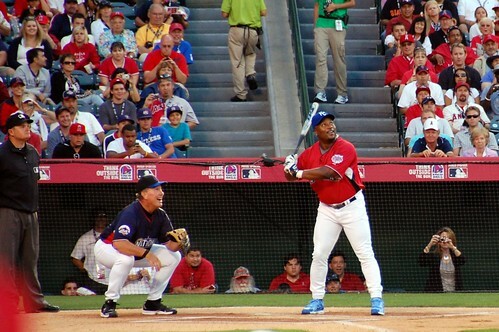 Bo still knows baseball. He knocked it out of the park. Lots of people chanted, "Team Coco!" Handsome Mad Man and Desperate Househusband on second base. 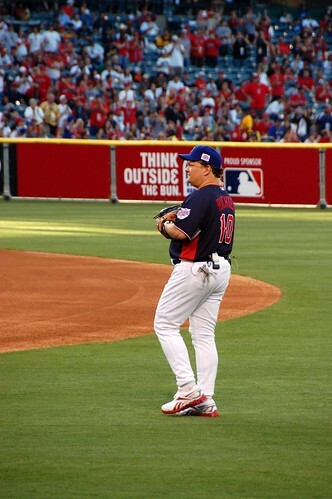 Did A.C. Slater letter in baseball? Go, Bayside! All male eyes were on this supermodel and Victoria's Secret hottie. 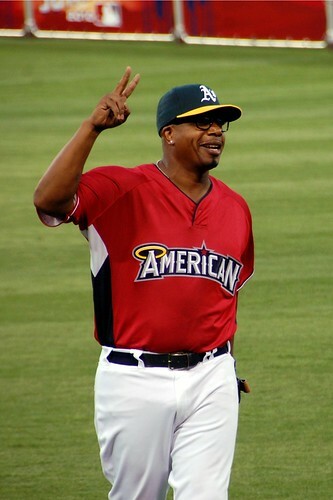 This former A's bat boy was 2 Legit 2 Quit when he hit a home run. U can't touch this! A little homage to our friend Mr. Cruiser's brother -- he plays Alcide on True Blood. Mr. Cruiser's brother is better at playing a werewolf on TV than he is at softball. But, really, there's no shame when the guy at first base is Mike Piazza. Fun outing! 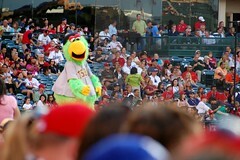 Jealous that Mr. Monkey is experiencing the real All-Star events, too! I can imagine what a hit all these hot dogs would be in Chile - people put all kinds of crazy stuff on hot dogs here. Not sure if you saw or even tried an "italiano," but that's one of the most typical combos and is a hot dog with avocado, tomato and mayo (green, red and white like the Italian flag). I think I had a heart attack looking at all the yummy eats. Your pics are great. 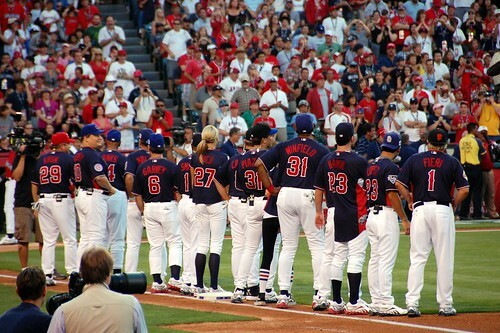 It's like you were on the field with them! Mr. Bumblebee wanted to attend this events so bad but we've had plans all weekend/week. Glad you guys enjoyed it! how fun!!! great photos (as always!) 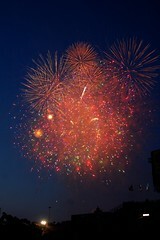 i'm especially loving the fireworks shots. which foods did you taste? what was your favorite? 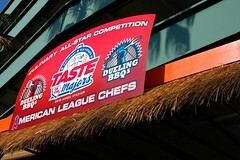 Oh man I wish I knew about the All Star Culinary Event. Everything looks so good and I'm sad I miss Pittsburgh's pastrami sandwich! btw, i'm DYING over your a.c. slater comment. HAHAHAHAHAHAHAAHAAAAAAAAA! 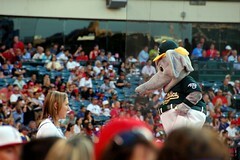 for a second there, jennie finch looked like kendra from girls next door! ha! The culinary competition is so fun! this looks like so much fun! 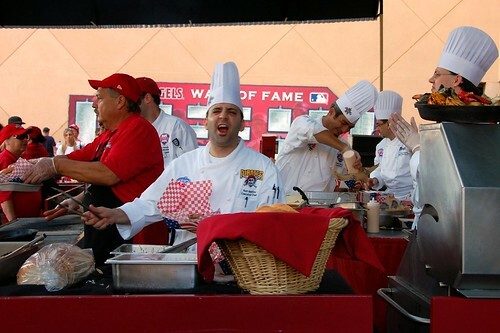 i had no idea about the food cook off, everything looks delicious. 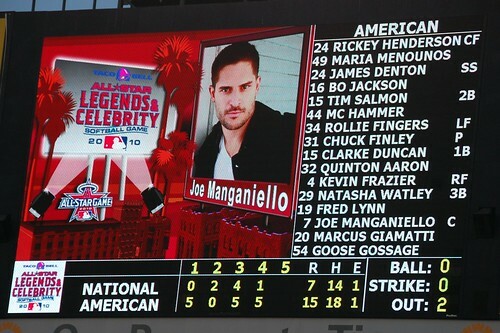 also, love your celeb shots (obviously) and james denton makes me swoon and go jennie with a homerun, that is awesome. I love how much more awesome your food recaps are than mine. haha! OMG! 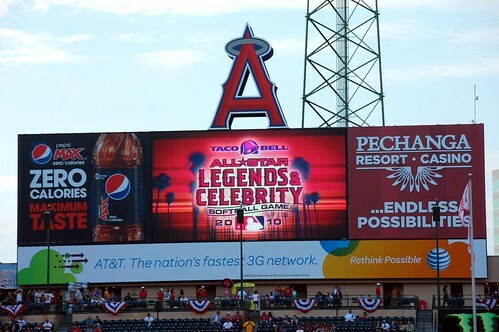 looks like an amazing event... made me drool, as always!!! Question: Were you able to eat all that food? i am so jealous!! the food looks soooooo delicious.. 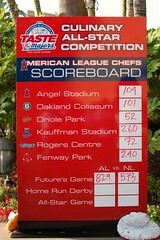 I would enjoy sporting events much more if they all had the culinary deliciousness that this game did. 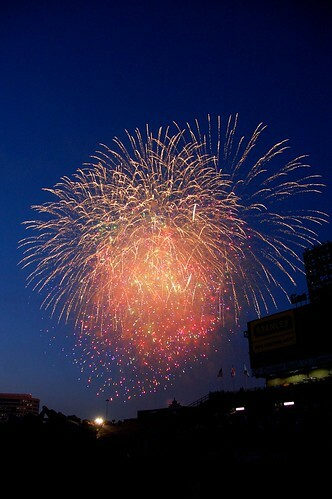 Best sporting event ever!! I hate sports and I would have loved that. 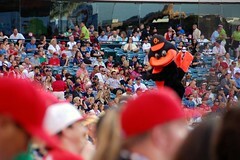 The only thing that would have made it even better was if there were wild animals like tigers and chimps on the field. 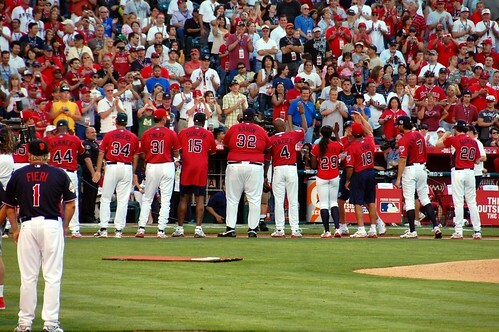 Some of those celeb baseball dudes look anorexic. 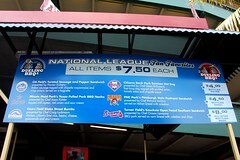 I always say, I only go to baseball games for the food. 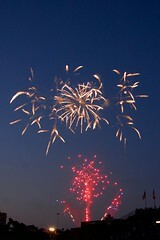 Gawwwwd, I wish I could have been at this one! 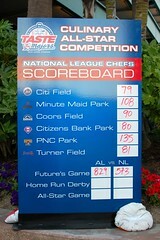 My vote for most appetizing goes to Atlanta Braves...mmm! Those were some of the craziest American BBQ foods I've ever seen! Looked all amazing, wish the stomach were big enough to eat them all in one day! 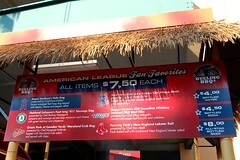 wow, the lobster roll!! 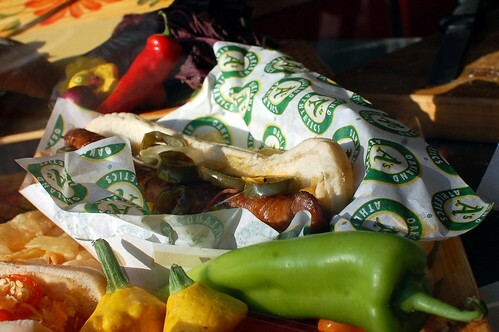 i never thought i'd drool over stadium food!